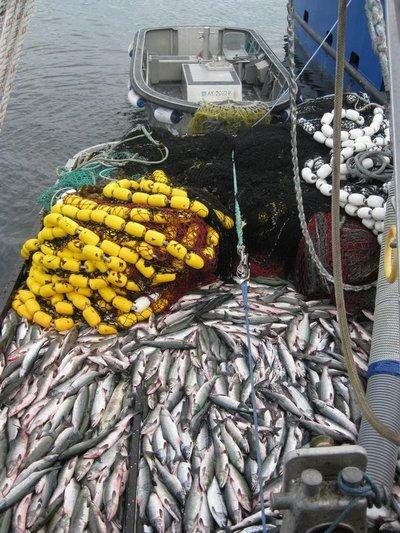 A load of salmon from Prince William Sound, Alaska, awaits delivery to a fish tender. The most widely-used way of measuring the health of ocean ecosystems is wrong as often as it's right. And that can lead to thinking that fisheries are sustainable when they're really not. That's according to Trevor Branch, a professor of aquatic and fishery science at the University of Washington. Branch is lead author of a paper about to be published in the journal "Nature." The current way of taking the pulse of a marine ecosystem is to look at the proportion of fish caught that are higher up the food web -- for example, tuna or salmon-- compared to those caught from lower down the food web, say, mussels or shrimp. If the part of the catch from higher up is growing, it indicates the ecosystem is improving. But when Branch and his co-authors looked at those catch numbers and compared them to surveys and assessments -- where researchers go out and count how many of what kinds of fish are actually there -- they found the catch- number method wasn't reliable. "Applied to individual ecosystems," Branch says, "it's like flipping a coin. Half the time you get the right answer and half the time you get the wrong answer." Branch says to get a true picture of ocean ecosystems you need to do more surveys and assessments that look at the critters in the water, not the ones being pulled out of it.